Logitech has a lot of pride riding on its mice. It has brought disruptive technology to market in the past, scoring a first with laser optics in its mice in 2004, for example. With the LX7 the company has decided to drop the laser light source and go back to an LED on the underbelly, presumably due to improvements in camera sensitivity and to save battery power. Indeed, Logitech says two AA batteries will give eight months of power under normal use, and longer if you use the on/off button. A small green LED light, far less showy than the bright lasers on many other mice, gives all the light the camera needs to track surfaces. However, we still had a bit of trouble tracking movement on the reflective and black paper surfaces. To hold this mouse is to bask in ergonomic splendour. From the first touch it just feels right. Rubber-coated flanks help you grip and, although the top surface is polished plastic (read sweaty palms), it generally sits very happily in your paw. A slimmed waist design gives a snug fit for your thumb and ring finger. 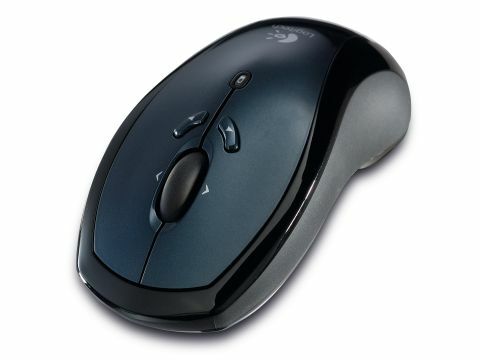 The LX7's size is mid-way between a mini-mouse and chunkier offerings like the Microsoft Laser. This was probably the most comfortable of all the mice in its class to hold. There are four buttons, all programmable, and sideways tilt controls with a right or left nudge of the wheel. A sensible addition is an on-top battery level indicator behind the scroll wheel, which will be useful for gamers trying to avoid flagging batteries and command lags. As a cordless mouse the LX7 has an impressive signal range. We could control the desktop from 18 to 20 feet away. All in, this is a well-performing and comfortable mouse for general desktop use and presentations.